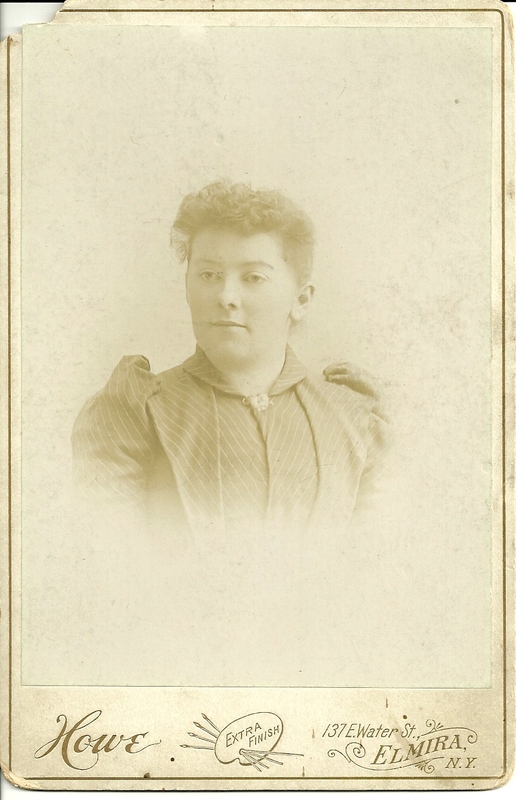 Cabinet photo taken by Howe, 137 E. Water Street, Elmira, New York, of a woman identified as Miss Mathewson. The end of her surname is missing with the small chunk eaten out of the upper corner, but there is clearly an "o" after Mathews, and I assume an "n" was on the piece missing. Searching online, I found a Lizza Mathewson, born about 1858 in Ireland, living with her sister Margaret McCan and husband J. P. in Elmira in the 1880 Census. Lizza was working as a sales lady in a shoe store. Perhaps Lizza is the lady in the photo. If you have more information on the further identity of Miss Mathewson, please contact me.